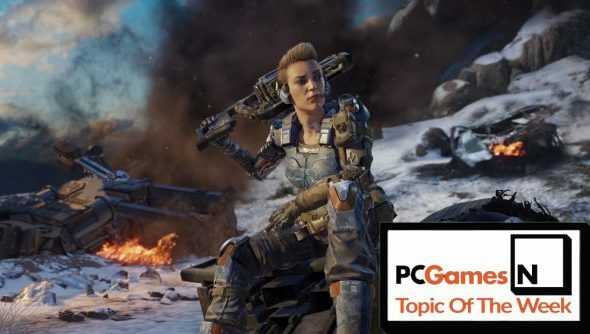 Topic of the Week: Should Call of Duty be a permanent client akin to F2P games? Wednesday means it’s time for our Topic of the Week, and this go round we’re talking Call of Duty. With today’s revelations about Infinite Warfare, we’ve been thinking about Activision’s money-printing machine and how much its release model is still tied to last-generation thinking. While they push into eSports, microtransactions and large yearly updates, they’re still sticking to boxed releases and big release party blow-outs rather than the accepted norm of large patches and expansions. Does it need to be that way? There’s certainly a workable free-to-play model for CoD out there somewhere, as demonstrated by the best free PC games. On the one hand, a single, regularly updated client with either a subscription or cosmetic micro-transaction model would definitely be easier on the community, help keep them as one cohesive bunch and allow the eSports scene to grow. It wouldn’t even need to be free to play, our Matt suggesting to me a Netflix-like service where you get the full CoD experience – all the past games, regular new multi- and single-player content – so long as you maintain payment, and nothing otherwise. Of course for the dollar-counters at Activision, it’s a different story. Call of Duty is regularly the largest new game launch of the year it is released in, netting hundreds of millions of dollars for developer, publisher and retailer alike. While that continues – and there’s no real sign of it slowing down, even as the high street stores have a worse and worse time of things outside of these major releases – it’s a hard argument to say things should move away. What do you think? Would CoD benefit from a change in structure? How would you do it, and if you’re not a player what could they do to entice you to try it? Let us know below.